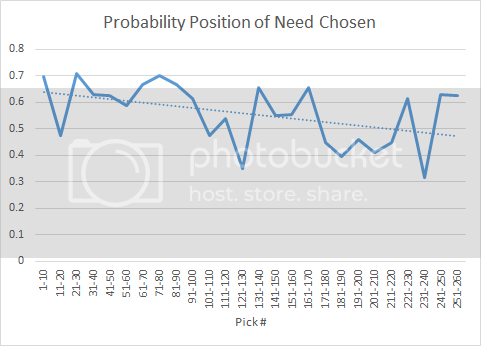 Now the model looks at the team needs for the team (currently) holding each pick number, and if the prospect in question matches one of those needs his probability of being selected at that pick is boosted. And if his position does not match the selecting team's needs, his probability of being selected at that pick is depressed. 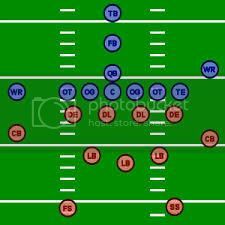 All of this depends on how we define team need, which can be a matter of debate. For the model's training data, I used a consensus of several reputable sources for team need, including guys like Mel Kiper and the Ourlads scouting service. The draft model incorporates team need and position inputs the same way it considers other factors, using Bayesian inference. There's one additional wrinkle to mention, and that's trades. Trades can happen at any point, changing the team need at a particular pick number. The model's strength of the team need consideration is therefore reduced by the likelihood of a trade. Here's how including team need into the draft model changes the results. 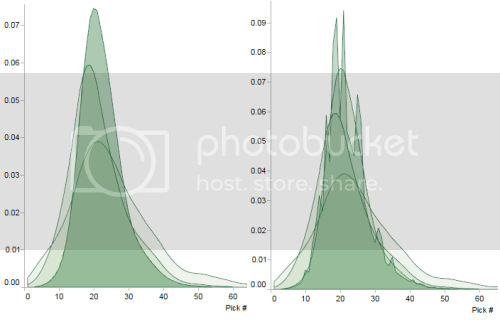 The chart on the left is the probability distribution for a sample player prior to adjusting for need. Notice how continuous it is. The chart on the right shows how things look after considering team need. It's jagged and discontinuous (because team needs are discontinuous). It's also more confident because we have more relevant information. The spikes in the final resulting distribution correspond to where the player's position matches team need. The only drawback is that it's not as aesthetically pleasing as the mesmerizing Bayesian refinements on the left. If you're wondering if we could tune the model for specific team tendencies when it comes to drafting for need, the answer is we could, but it would probably be a bad idea. There isn't a long enough track record under enough varying conditions to have any statistical certainty. Trying to tailor the model to individual teams would fall on the wrong side of the bias/variance trade-off. Team executives change, individual executive's philosophies change, circumstances change. We'd need many years of draft observations to have confidence that a team tends to draft for need any more or less often than the league generally does as a whole. But in case you're curious, here's how often each team has picked for need through all 7 rounds since '11.